Artworks by Sassoon artists Hiroshi Suzuki and Colin Reed. Image courtesy of Sylvian Deleu. 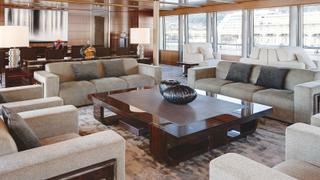 Far more than on land, yacht interior design is about function and future. No one wants to wear a swimsuit in a formal saloon and in 10 years there might be the safety of grandchildren to consider. Years ago I was a guest on Arctic P and the difference between yachts and homes was so clear. No matter how luxurious guest cabins are, everyone on board gravitates towards the saloon that offers the most space and comfort every time. 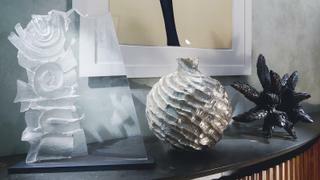 Unlike land-based homes, art on yachts can’t be easily moved so should never be an afterthought. Sculpture works well, as do themes of travel and wildlife, but I would never choose a painting of another yacht. Whether onshore or offshore, however, scale is imperative. I can’t bear seeing two small pieces pretending to be one large one. Yachts don’t have the architectural history of buildings so a degree of modernity is essential. 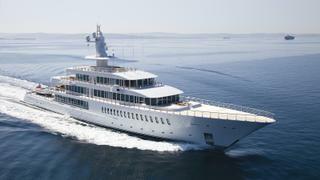 And there’s no excuse for bad quality on superyachts. Owners who are really invested in their yacht’s specs often let themselves down by filling it with mass-produced items. Larry Ellison’s Musashi is stunning because the interiors (pictured top) are so in keeping with the style and quality of the yacht.